Achieving health and wellbeing goes beyond the absence of disease as it is determined by a range of factors such as the environment, culture, gender, biology, and politics and is in fact complex and multi-dimensional. For practitioners wishing to improve health outcomes we need to explore what being healthy means to those individuals and communities with which we are working. Practitioners often have their own ideas of what healthy means and our contracted outcomes and outputs may also identify what this means but it may not be the reality of our communities. To achieve sustainable health outcomes we need to ensure that we are meeting the needs of our communities. We also need to understand what affects people’s health and communicate this effectively to the communities with which we work and our colleagues both within and outside of the health sector. 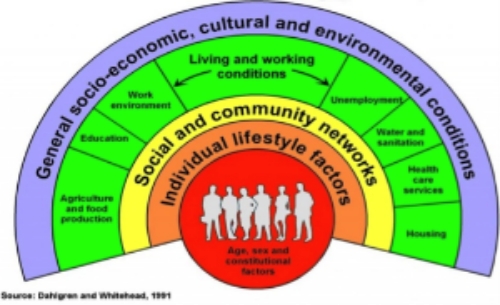 The Dahlgren and Whitehead diagram is a few years old but is effective in explaining the range of determinants that influence health both positively and negatively and the interconnectedness of each determinant. As practitioners we need to stop working in silos and with topic or issues based approaches. A holistic approach to health is the most effective approach to achieving sustainable health outcomes. Within New Zealand there is a holistic health model named Te Whare Tapa Whā (Durie, M. 1998). A Māori health model that supports a holistic approach to health and identifies the four cornerstones (or sides) of Māori health. With its strong foundations and four equal sides, the symbol of a house illustrates the four dimensions of well-being which are physical, mental and emotional, social and spiritual well-being. Should one of the four dimensions be missing or in some way damaged, a person may become unbalanced and unwell. The approaches identified are ways in which to undertake effective health promotion that reflect its values and principles of empowerment, inclusiveness and respect based on evidence and effective health promotion competencies. The approaches above provide opportunities to communicate with communities and work with them to provide solutions to the complex and multi-dimensional health and wellbeing issues affecting us all locally, nationally and globally.